The Xplore micro fibre line (FL) can produce fibres or mono filaments from just 5-10g of material in just 10 – 15 min, thus stretching the number of screenings and shrinking your development time. 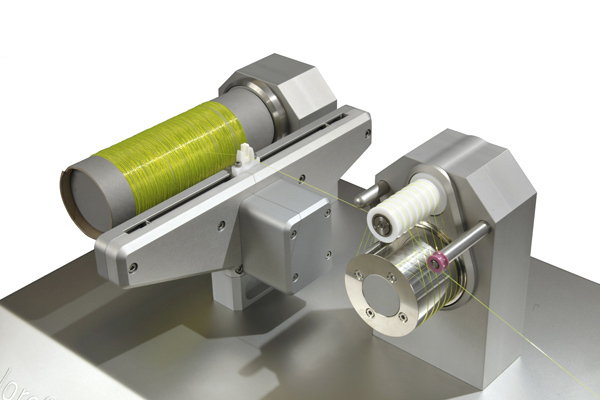 Our micro fibre spin device is fully compatible with our high precision micro compounders and extruders. Cutting edge laboratories use the FL to make maximum use of (costly) synthesized materials and (costly) additives and to save development time. Continuous feeder kit. No need for an additional spinning pump, as our micro compounder is featured with throughput control to secure uniform fibre diameter. High speed winding unit (up to 200 m/min) and low speed stretching unit. This innovative design allows the equipment to fit on a laboratory bench. Selection of fibre dies. For multiple fibre spinning applications.